Endangered Delicacy- It's that time of year again, when the sea turtles nest on the beaches of Costa Rica. Actually in Costa Rica it is all the time, but more people are aware of these hatchings during high season. 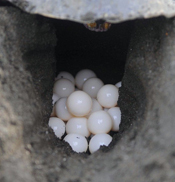 Turtle eggs are believed to be an aphrodisiac and help fight erectile dysfunction. My mouth is watering! They are therefore often illegally poached and sold throughout much of Latin America, the forbidden egg. I had the pleasure of seeing these amazing creatures come ashore en mass in Ostional, on the Pacific Coast years ago. Ridley turtles arrive here in one small stretch of sandy beach to lay eggs. It is unclear why this particular spot is chosen.